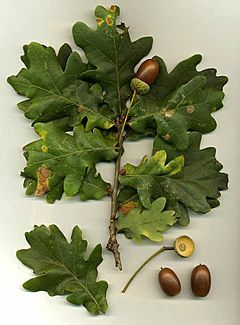 Oaks have spirally arranged leaves, with rounded edges in many species; some have leaves with jagged edges or entire leaves with smooth margins. Many deciduous species do not drop dead leaves until spring. In spring, a single oak tree produces both male flowers (as catkins) and small female flowers. The fruit is a nut called an acorn, carried in a cup-like structure. Each acorn has one seed (rarely two or three) and takes 6–18 months to mature, depending on species. The so-called "live oaks" are evergreen. They are not a taxonomic group, just a life style which occurs across the genus. The oak is a kind of hardwood forest tree. They are well-known for being a climax vegetation in the temperate zone of the northern hemisphere. What that means is, left untouched by humans, it would be the dominant tree. Much of England was covered by oak forests before modern farming took over the land. The last extensive oak woodlands were cut down to build ships for the Royal Navy in the 18th century. Some kinds of oak wood are very hard. A lot of furniture was made from oak wood, but the wood is now scarce and expensive. Much cheaper are softwoods like pine. Oak trees can live up to 1000 years. 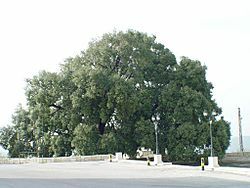 A mature oak tree stands about 100 feet tall (~30 metres). It is a home for more animals than any other European tree. 30 species of birds, 45 different bugs and over 200 species of moth have been found on oaks. Beetles burrow under the bark, and some drill holes into the wood. The leaves are eaten by many caterpillars. Many leaves carry strange little bumps on the underside. These are insect galls, caused by many little animals. Midges, moths, worms and tiny wasps lay their eggs in leaves or leaf buds. The leaf reacts by forming a growth around the eggs. Inside the gall, larvae develop. The leaf falls, but the larvae may come out only the next spring. Small galls only have one larva, but larger galls may contain as many as 30 larvae. Oak trees produce acorns once a year which ripen in autumn. Oak trees may start producing acorns when they are about 20 years old. A mature oak may produce 90,000 acorns a year; this is several millions in its lifetime. Oak Facts for Kids. Kiddle Encyclopedia.